Fast and furious, the rain falls. Brianna Mercado, wearing a shirt the color of sunshine, is intently watching it through the living room window. There's not a tear in her eyes. In fact, there's a serene smile on her face. Brianna has a positive attitude. She's not going to let it -- or anything else in this world or the next -- get her down. "I see myself as un-messable, which is a word I made up," says Brianna, a tall woman with short auburn hair and intense eyes. "I'm Yoda, Wonder Woman and Mary Poppins -- wisdom, strength and positivity." Brianna has had to channel the full force of this fantastic and formidable triad more times than she'd like to count. She takes things one day at a time. Yet as Brianna tells her story, she skips over life-threatening sections as if silence will erase them from the body of her memory. When she was growing up in San Jose, California, she dreamed of spending all her time dancing. And that part of her life did come true: She's a professional dancer. "My mom signed me and my twin sister, Sabrina, up for lessons when we were 5," she says. "And my dad made me repeat the sentence 'all I want to do is dance' all the time. I loved the movement of dance." At the University of California, Berkeley, she let her feet lead her. After graduation, they brought her to the Broadway Dance Center in Manhattan. "I lived in a closet in my sister's apartment in Astoria for three months," she says. "I put an air mattress on the floor, and my clothes hung above." Like a lot of creative young people, Brianna took a steady job to pay her bills and to promote her passion. She's the social media director for a small business and teaches dance. She turned her kitchen into a choreography center/practice space, and she took a roommate -- Sabrina. At this point, Brianna stops talking. She's 24; there's really nothing more to say. Brianna's been dancing since she was 5. But wait a minute. What about the cancer? "Oh, yeah, that," she says impatiently. If you must know, it started with a small, innocent-looking lump on her chest. "The doctors thought it was a fat or calcium deposit," she says. "They told me that by the time I reached 30 or 40, it would be large enough to justify removing it." She was 15. Thirty or 40 was a lifetime away. But it grew as quickly as she did. "It started turning purple, and soon it was painful," she says. "It hurt when I dived into the pool and even when I hugged people." The final diagnosis was Ewing's sarcoma, a type of bone cancer that concentrates on children like Brianna. "I had no idea what this would mean to my life," she says. "Dying young was something that I only saw in tragic movies or read about in novels." Surgery. Four rounds of chemo. Another surgery. Ten rounds of chemo along with 25 rounds of radiation. She doesn't hide her scar. "I missed my entire sophomore year of high school," she says, adding that the treatment left her weak, nauseous, bald and often bedridden. "I guess if you have to miss a year, that's a good one. At least it wasn't my senior year." But she emerged with good news. "The doctors told me I was home free," she says. And she was. For several years. In 2013, she found a lump in her thyroid, which led to the removal of that gland and the need for Brianna to take vitamins, supplements and medication and have regular checkups for the rest of her life, however long or short that may be. 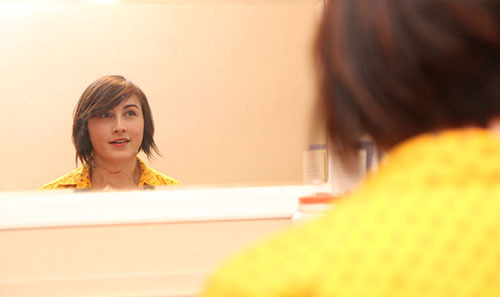 "The cancer has spread to my ribcage," she says. "I have one doctor who wants me to do more radiation, but I don't want to put any more chemicals in my body. Another has the opposite view, so I'm getting a third opinion." Brianna tries to see the bright side of everything, including the cancers. "They made me wake up and gave me practice in seeing little things like the rain that is falling now," she says. "I tell people that I'm 2,400 years old because I've been through a lot. My life gave me maturity." Brianna does every little thing she can to focus on the present moment and make it positive. Such as wearing her favorite color, yellow, which reminds her of happiness. The top she has on is low-cut. 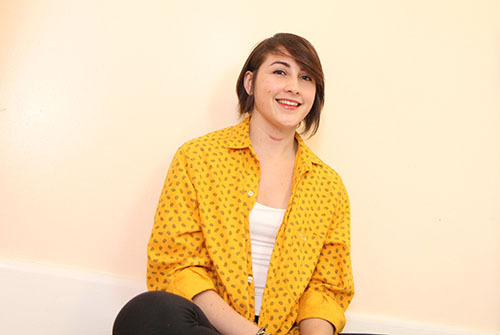 She doesn't attempt to hide the surviving slit-like surgery scar that smiles from the center of her neck. Brianna's looking forward to a full life. 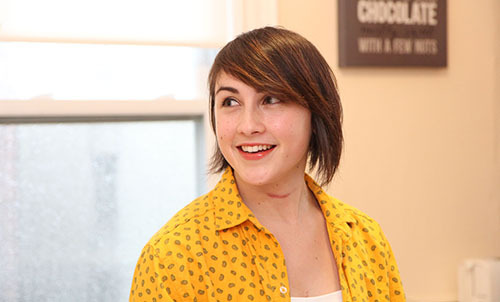 When Brianna's not dancing or teaching, she's mentoring a 15-year-old girl who was diagnosed with leukemia and telling her story, in words and steps, to motivate others, sick and well, to live life to the fullest. "I don't let my cancer serve as an excuse to feel sorry for me or to pity me or to give me money," she says. "I don't want to be yet another cookie-cutter cancer story." She hopes to develop a movement/therapy/art program to help other cancer survivors. "I don't fear death because it is going to happen someday so I want to make the most of what I have," she says. "I'd rather live a life of 'oh wells' instead of 'what ifs.' But I don't want to die of cancer. 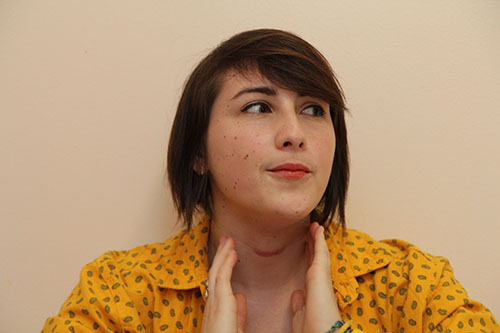 Thyroid cancer is treatable, and I'm young and can recover fast."